Have I mentioned the 14 inches of snow Salt Lake received last weekend? Oh, I have? Twice already? Well, let's make it three. Last Saturday, it snowed steadily for almost the whole day - great, wet, fluffy flakes that clung heavily to every tree branch and laid gently on the ground. I am not a snow fan, unless I can stay cozied up inside and just admire the beauty of it from my window. 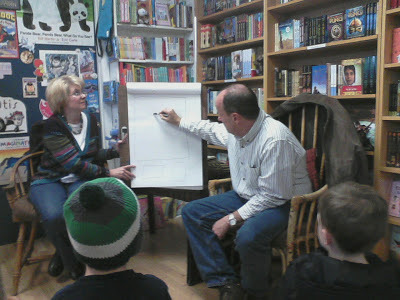 But last Saturday, I did not want to stay inside because our local bookstore (The King's English) was hosting Caralyn and Mark Buehner for a book signing. So I bundled up all three boys, and we trekked our way through the untouched white. Anyway, the snow kept a lot of people away, and there were only nine other people at the signing. Bad news probably for the Buehners but great for us. 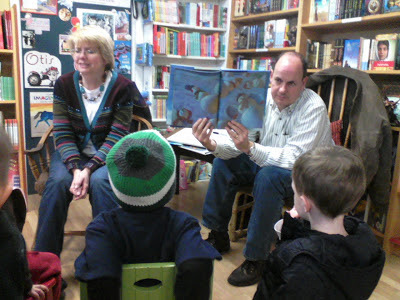 Mark and Caralyn Buehner are the husband and wife co-creators of Snowmen at Christmas (one of our all-time favorite stories), as well as dozens of other books (including Wittilda, which I talked about a few weeks ago). 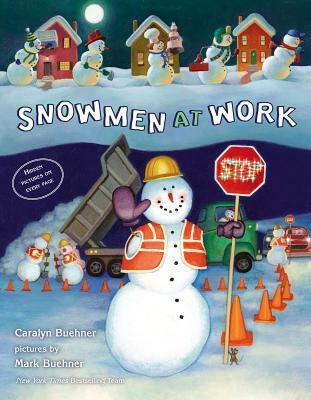 Their latest book, Snowmen at Work, just came out, and it is a delight. The Buehners were so fun. Mark began by showing the process he goes through when drafting the illustrations for a book. He will often draw the same picture from many different angles and vantage points before settling on the one he likes best. He showed the kids what a giant would look like from a duck's point of view and a duck from a giant's point of view. Then, because there were so few kids there, each one got to choose an animal for him draw. Aaron chose an alligator, and Max chose a dragon. Then Caralyn read and talked about all four Snowmen books. I always love hearing any stories behind the story, and it was especially fun with the Buehners since they are from Salt Lake City, so many of the illustrations are inspired by things right in our very own neighborhood. Caralyn also pointed out which illustrations are her favorite, and I loved hearing her speak so fondly of her husband's talent. This would be a great book to use if you wanted to explore different grown-up jobs: there's a dentist (that one is a really funny picture), a mechanic, a pizza delivery snowman, a store clerk, and several more. One of the things I love about Mark Buehner's illustrations are all the hidden pictures...so it reads like a story, but then you can go back and spend hours (okay, maybe not hours) finding all the hidden objects, so in that sense it kind of doubles as an activity book. Also, I have decided that no one else can draw Christmas lights as well as Mark Buehner. They kind of mesmerize me and make me happy. I promised Mike that we were just going to the bookstore to listen to the Buehners, not to buy any books. But once we were there, and we were having such a fun time listening to them and the new book was so cute, well, I just couldn't help myself. (And it wasn't an "I solemnly promise" kind of promise; it was more like, "Don't worry, I'm not going to buy anything" kind of promise. Mike should know me well enough to know that some promises are impossible to keep unless I just stay away completely). Anyway, so we bought Snowmen at Work, and I'm so glad we did because it gives us something tangible to hold onto so we can remember the fun we had. Plus, we got it signed. Plus, we really like the book and have read it again and again already. Oh, but do you want to know what the best part of the morning was for me? Remember the pictures Mark Buehner drew for each of the kids? Well, they got to take them home! I don't know why, but this just thrilled me: a real artist drew a picture for my son, and he got to keep it! We are going to frame them and put them up by their beds. Even if the snow cut down on the number of people who came, I thought it was so appropriate to have snow for the newest Snowmen book. We are so glad we got to meet the Buehners. This post is linked up to The Children's Bookshelf. I'm sorta jealous. I love snow. Oh, yes! I saw it and was so, so flattered. I actually left a comment early this morning, but I just went back to your website, and I don't see it, so maybe there was some sort of glitch. Anyway, it basically said thank you for mentioning me, and I love The Children's Bookshelf, too, for the wealth of ideas it brings together! That book looks good, how great to meet the authors and get a picture to take home! It is such a great book. I highly recommend it and the other Snowmen books as well. So jealous of the snow. We had almost NONE last year. I'm hoping this year is different. I love the Snowmen books! That is so awesome! I was so excited when I saw it in the deseret book at. It's on hold at the library and I just need to brave the torrential rains to get it. I love that they could keep the pictures and you're framing them!!!! That is so exciting. I remember I while back when I met Eric Litwin at our local library. He sang his songs and read his books to the kids. It was really a very neat experience. I've never read the snowman books so we will have to check them out! I just put up the Librarian Snowman on my bulletin board at the library and added it to my community helpers book list. Love these books!